After visiting Polygon's HQ and riding Mt. Bromo on East Java Mitch and I were off to the next island east, Bali. 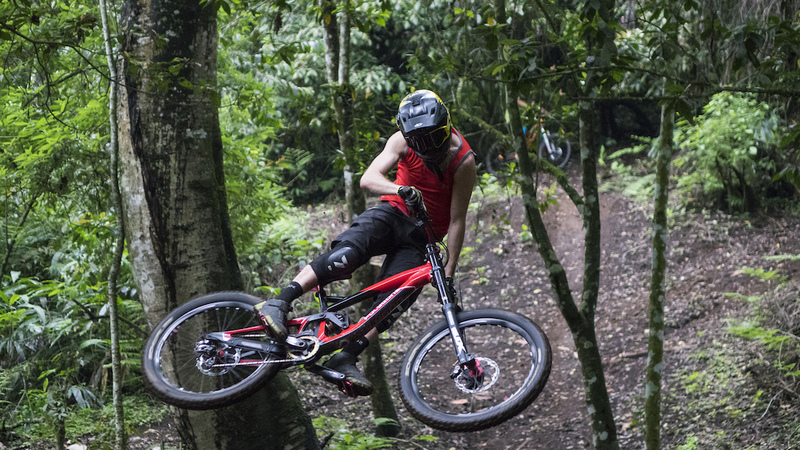 We were connected with the Bali Bike Park crew and excited to see what was in store. We arrived at The Chillhouse; who own and operate the bike park, and we were stoked! Located just a short scooter ride from the ocean, we were welcomed with amazing rooms with epic outdoor bathrooms, great food, great staff, travellers from all over the world and of course a chilled out atmosphere with pools, a yoga studio and a chill zone. Our plan was to ride the Bali Bike Park for a few days and then continue our search for some waves. But once arriving at the Chill House it was hard to leave, it was just too good! The locals told us that during the wet season it would rain in the mountains at 2pm like clockwork. We woke up early and started the short commute to the mountains where the Bali Bike Park is. We arrived early to a quite area through a few small villages and loaded up the 2 land cruisers they had waiting to take us up the mountain. I was surprised with the amount of trails they had weaving through the jungle and we didn't stop shuttling until of course the down poor came. The riding stoke was high as we headed back down to The Chillhouse where it was still nice and sunny with more than enough time in to fit in a sunset surf... not bad! Next on the hit list was Mt. Batur. We had heard there were open slopes to ride much like the ones we saw and were not allowed to ride at Mt. Bromo because of the eruption. The next day we set off inland for Mt. Batur to have our mind blown once again. 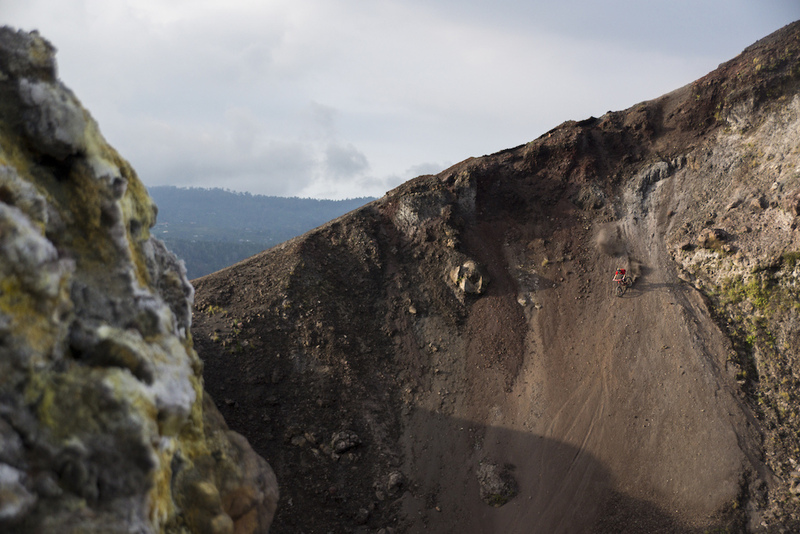 A huge Volcano with ridable slopes within another super crater. We weaved down the inside of the super crater to the valley below where we would be hiking our bikes back up to the same elevation we had just driven down from on the inner Volcano, Mt. Batur. 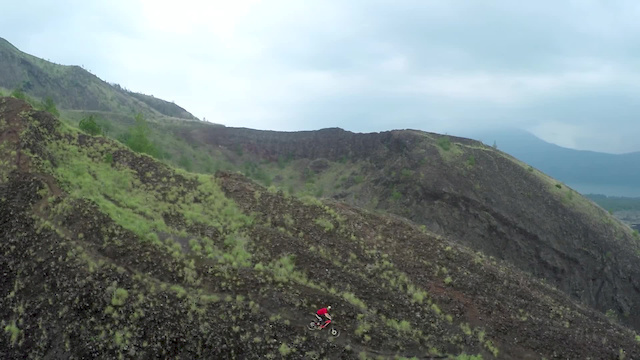 It was so cool to see how these volcanos have shaped the landscape and we were able to find a few lines with great dirt in-between a lot of gnarly volcanic rock that was less then ridable when you got close. 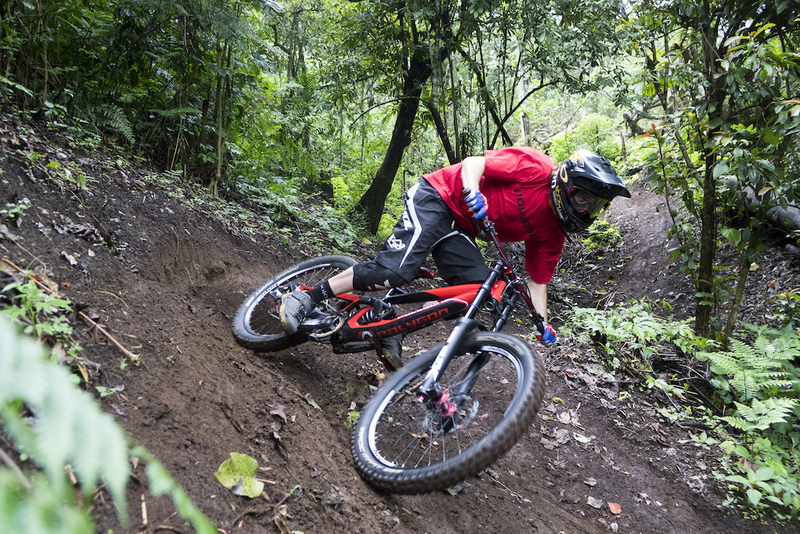 I couldn't believe how perfect some of the dirt was to ride and was so stoked to lay some carves down an actual volcano. It was tough to say goodbye to this tropical paradise but I know I will be back! Big thanks to Polygon Bikes, Solos Productions, The Chillhouse, Frank and the rest of the Bali Bike Park crew for the hospitality! We had such a cool time riding with Kurt! So stoked to see this video come up. Good vibes! About time we had some Rebelution in a MTB video. They have a lot better songs, but this one is still good. Looks like a great place to ride! Nice but.........Waaaay too many cuts man, this vid should have been at least twice as long. Reggae and Mtb just goes together. Most of my rides im rocking some Dominic Balli, bob Marley, tribal seeds etc. it just seems to accentuate a flowy trail to perfection???????????? Huge fan of Sorge. Great video. Nice riding. But cant find words to describe how bad is that song. It did stress me. Kurt looks like he's on ice skates! It's not park of our park. But we can take people up there to ride if they want! oooooo what a tune! sick riding too. Can't wait to visit you guys. This video is awesome. can't go wrong with Rebelution!!!!!! ZOMG. My honeymoon can't come soon enough! Are you coming to Bali to ride for your honeymoon?! yeee mon! to blessed too be stress!